Preheat oven to 325 degrees F (165 degrees C). Grease and flour one 10 inch tube pan. Combine cake mix and pudding mix. In another bowl beat eggs, water, oil and rum until frothy. Add cake mix/pudding mixture and beat until well mixed. Spread pecans evenly over the bottom of the prepared pan and pour batter over pecans. To Make Glaze: During the last 15 to 20 minutes of baking time, combine butter or margarine, water and sugar in a sauce pan and bring to boil over high heat. Reduce heat to medium and boil rapidly until it's very thick and syrupy stirring very frequently. The syrup must be reduced quite a bit and very thick otherwise it will make the cake mushy. Remove from heat and add rum. While cake is still hot, poke holes all over top of cake with a toothpick and spoon glaze over top of cake. Allow cake to sit at room temperature for one day then refrigerate. 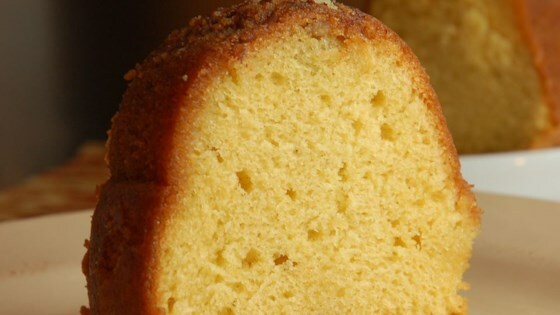 A yummy, rummy Bundt cake with a simple butter-rum glaze. Instead of poking holes in the cake, I poured the glaze into the Bundt pan and merely reinserted the cake into the pan allowing it to absorb all of the glaze. Took about an hour to do so. I took this to an office party and it went so fast. I used 160 proof spiced rum. Created holiday spirit for sure.